InSEA European Regional Conference 2012, Lemesos, Cyprus, June 25-27, 2012 www.insea2012.0rg The deadline for the Call for Papers the 15th of December, 2011. 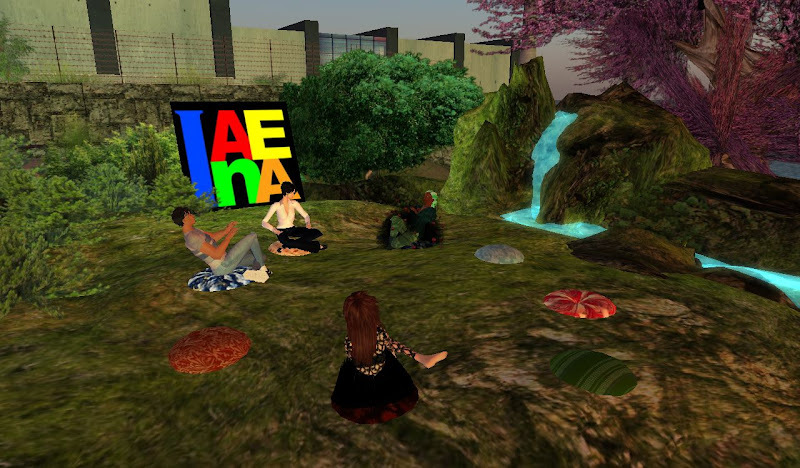 Sandrine Han: I am using the “sim on a stick” OpenSim for teaching this semester. It has been about 2 weeks, everything looks good. No big technical problem. (Somewhat easier to use than SL.) I will write a post about how to make it. Maybe at the end of the semester I will write another post about what the result is. Marylou Goldrosen: I want to learn this too from you! SageStage Minotaur: I am interested in sim on a stick” OpenSim. SageStage Minotaur: its open for all ages, which makes it possible to include in k-12. What are the drawbacks? SageStage Minotaur: hmmm, these two points are what I think are the uniqueness of potentials of Net art. But of course the insular security rather than global education seems to be considered "safe"
SageStage Minotaur: of course they can take it home if they have a computer at home.which is not the case for many students. I just returned from a week in NM and clearly this would be an issue with many. Most schools have a computer lab, but few art teachers in NM use the art lab. Instead to meet National Standards in Technology they do this as add on rather than integrated--so separate from art education. I meant use the computer lab. SageStage Minotaur: They don't use the computer lab--sorry I meant computer lab. There is often no art room too. SageStage Minotaur: art education can and has made a difference with mental health. However, it won't be an art education that focuses on performing or identifying 3 different ways to shade. SageStage Minotaur: and in hospitals, prisons, elder homes, veteran programs for families like Wounded Warriors. Right--the freelance or non-profits. Grant writing will be an important skill. DISCUSSION: Art education? Design education? What are the differences? Does the name really matter? SageStage Minotaur: Just like art education and art therapy are different fields, different histories, different theories & approaches, and different licensure or credentials. Sandrine Han: because design can help students to find a job.. yes, Karen, so, when we are teaching art education, should we include design education? SageStage Minotaur: art education can include both design and fine art and art from a broader visual culture--social theory perspective. SageStage Minotaur: Or art education can focus specifically on design or fine art from a social theory perspective, i.e., visual culture. SageStage Minotaur: Art from social activist perspectives is useful to real-life issues in bringing about change. Next meeting time: November 5th, 8 AM SL time= 8AM PST, 9AM MST, 10 AM CST, 11 AM EST, Sydney=1:00; Frankfurt=17:00; Taipei=23:00. You are very welcome to join us!